Why Do Dogs Like Feet So Much? Some dogs seem to be particularly fascinated with human feet, as revealed in the behaviors like licking, biting, or nosing your feet. This type of behavior can be an indicator of some greater physiological and social needs. What’s the Root of the Behavior? Dogs rely heavily on their highly receptive senses of smell and taste. There are several ways a dog could be using these senses so obsessively with your feet. For some dogs, licking your feet could be a very efficient way to learn about you. The sweat and oil on your feet can give a dog a lot of information– as can pheromones. There’s not much research out there on pheromones, but it’s reasonable to theorize that a dog that frequently steals and chews your socks and shoes, or licks your toes compulsively is attracted to your pheromones. For other dogs, licking or nosing at feet could be an indicator that it’s directing your behavior as a member of its pack. Interacting with your feet could be a signal that your dog wants to feed it, play, or interact with it in a way that meets its needs. If the dog is a herding breed and licking and nipping at your feet, it could be trying to herd you. Dogs also may lick feet because they are stressed and feel soothed by the endorphins released while licking your feet. And some dogs lick feet simply because they like the taste of the salt in your sweat. If the dog is lacking in nutrition, it could be specifically seeking out salt for nutrients. Veterinarians recommend kindly discouraging this behavior without punishing them or shouting. Remember that licking is a natural instinct in dogs and punishing them for this instinct could make them feel less safe around you. Instead, redirect the dog’s behavior to something more preferable like sitting or laying down and reward the behavior with positive reinforcement. You’ll especially want to redirect behavior if the dog is a foot-nipper. If you keep a toy in your pocket, you can draw the dog’s attention away from your feet and more easily redirect the behavior from there. While there are still some mysteries to be uncovered about why your dog chooses to focus on your feet, you can rest assured that it’s a fairly natural behavior. And as long as your dog is healthy, there’s nothing to worry about. Just make efforts to redirect the behavior if it becomes a problem. Weird question, we know, but have you ever caught a whiff of your dog’s paws? Many people describe their dog’s paws as smelling like corn chips, popcorn, or Fritos. So is this something you should worry about, or is your dog’s smell just making you strangely hungry? The short answer: It’s pretty normal, and probably healthy. What Causes the Corn Chip Smell? This smell is usually caused by bacteria that naturally reside on your dog’s paw pads. These bacteria– particularly Proteus and Pseudomonas bacterias– give off yeasty odors. That’s the corn chip smell, and it’s a natural odor. Nothing to worry about! Dogs sweat through their feet just like humans. Sweat can become trapped in the coat between the foot pads and create a less desirable odor– worse than the corn chips smell. To avoid these less pleasant odors, you can trim the fur between the paw pads which will allow the sweat and smell to dissipate rather than permeate into the fur and further the stench. Just use hair clippers to carefully trim between the pads. After you trim, and no matter the severity of the stench, a bath is in order. Lather each of your dog’s paws with pet shampoo to remove sweat and debris then rinse completely. This should clear our the odor. If your dog is showing any of the symptoms listed above as well as putting out a particularly foul stench, it’s time to consult the veternarian. The corn chips smell is normal in dogs, but make yourself familiar with the signs of a greater problem so that you can tell the difference between a healthy dog smell and a not-so-healthy dog smell. Want a solid solution to keeping your dog’s paw pads healthy and having plenty of traction? Check out PawFriction! When a dog’s nails get too long, it can make it hard to walk. The counterpressure from the ground pushes the nail back into the nail bed– causing pain in toe joints and creating a risk of nail injury. This is why it’s important to trim nails. When nails aren’t trimmed well or don’t wear down naturally, this can cause painful ingrown nails. Torn or fractured nails can happen if your dog catches a nail on something. They can be very painful, sometimes bleed, and are best treated by a veterinarian. Your dog’s paw pads are supposed to be fairly rough– this is so they can get traction on smooth surfaces like hardwood or tile floors. But dry and cracked paw pads can be caused by extreme environments like hot surfaces, icy surfaces, chemicals, and rough terrain. Like with dry and cracked human hands and feet, dry and cracked paw pads can be very tender and susceptible to infection. It’s important to moisturize your dog’s paw pads with safe pet moisturizer to keep them healthy. 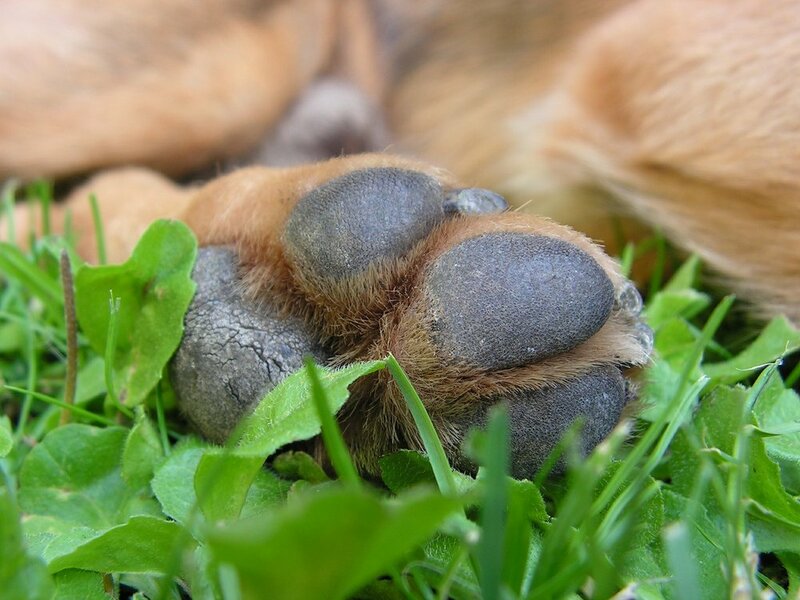 There’s normally a cornucopia of bacteria and fungi species taking up residence on the pads of your dog’s paws. It’s only when these organisms occasionally overpopulate and cause an infection. Typical signs that your dog’s paws have been infected are redness, swelling, itching, pain, and drainage. The most common fungi culprits for infecting dogs are yeast and ringworm. Your veterinarian will be able to diagnose and treat the infection with topical creams, wipes, and washes. Just like humans, our pets can also suffer from allergies. Allergic reactions typically occur more in the ears, skin, or in their glands, but sometimes they will affect the paws. Similar to a fungal or bacterial infection, your dog will be itchy and lick or chew on their paws to relieve the itching. If your dog is chronically licking their paws, ask your veterinarian to evaluate them for allergies. Hot pavement can cause burns and blisters. The rule of thumb is: if you can’t hold your palm on hot pavement comfortably for 10 seconds, it’s too hot for your dog’s paws. If your dog does suffer from a burn on their paw pads, they will look red, swollen, and possibly blister. This is a very serious issue that you should treat with first aid at home and immediately contact the veterinarian for proper medical attention. When dogs run and play on rough terrains, cuts and abrasions can happen from time to time. Sometimes foreign objects can become lodged in your dog’s paw pads– like little rocks, sticks, broken glass, and debris. These can either cause cuts or lacerations or even exacerbate existing cuts. Be sure to check the bottoms of your dog’s paws when you suspect an injury and treat with first aid if you find a wound. Similar to a burn, this injury calls for a vet’s medical attention. If your dog has been spending time out in forests or hiking, they can sometimes pick up ticks. Ticks are infamous for hiding in between pets’ toes and those can be difficult to spot. However, if they go without being discovered for long, they can cause a lot of problems. It’s best to have your vet deal with removing the tick, but if that’s not possible, use a lighter to heat the tip of a needle, lightly poke the tick with the needle until it releases, and use tweezers to pluck the tick away. Mites are also common parasites in dog paws which can cause swelling, scaly skin, and hair loss. Your vet needs to run tests to diagnose and treat mites. Skin growths like cysts or lumps sometimes crop up on paws or in between toes. Consult your vet if you find one so they can treat it and remove it if necessary. Try to keep your dog’s paws healthy by checking them regularly, moisturizing, and ensuring they are well protected. Do you have a senior or special needs dog? Pawfriction can provide your pet with needed traction for their paw pads. Check out Pawfriction for your pet today. There have been countless journals, scientific papers, articles, blogs, stone tablets, and any other media form you can imagine dedicated to the topic of obesity in our pets. The latest figures are showing that almost 55% of dogs are classified as obese and almost 60% of cats...that is a massive number of our pets that are overweight. The problems with obesity in veterinary medicine closely mimic that of human medicine. We know that obesity leads to an increase in the risk of developing a variety of diseases including, but not limited to, orthopedic issues, cardiac issues, respiratory problems, diabetes in cats, renal disease, and many more. Personally, I think the most significant issue is that obesity is closely linked to a reduction in the length of the lives of our pets. A recent paper released here (https://www.avma.org/News/JAVMANews/Pages/190301n.aspx) discusses how obesity affects the lifespan of breeds differently. Why is obesity so common in our pets? I think the answer is as simple in pets as it is in people - it boils down to diet and exercise. To us pet owners, food is love! We train with treats, we share our meals with our dogs, kids love to feed pets, and there is an unshakable bond there that builds over time. We often don’t realize how many calories are pets consume in a given day. I can’t tell you the number of times I sat down with owners to go over dietary plans and the calories quickly added up. Few of us realize that one milk bone dog treat can be the equivalent to ¼ of a bowl of food...and we often give many of them throughout the day. If the diet isn’t enough of a reason, many of our pets leave very sedentary lives. Sure, we walk them occasionally, but that is often not enough to counteract the sheer number of calories that they consume in a given day. How do you know if your dog is overweight? Honestly, it isn’t easy...even for experts. Probably the universal way to know is called the body condition scale (here is a great blog that covers it: https://www.thedrakecenter.com/services/pets/blog/fit-or-fat-your-pets-body-condition-score-bcs) but this method is very subjective. There are some other more complicated methods such as the Healthy Weight Protocol but I suggest asking your veterinarian. So you think your pet is overweight, what’s the next step? First, you need to rule out any secondary causes of obesity like an under-active thyroid or Cushing’s disease. Everyone knows the saying “Abs are made in the kitchen” and this holds true for veterinary medicine. The first step to fixing obesity is to get a true idea of how much your dog is getting fed...all the calories including human treats and extras, they all add up. Then you need to speak with your vet regarding what your dog “needs” to eat in order to maintain their current body weight. Once you have that number, it is a simple matter of dropping the amount you are feeding to achieve a 1% to 2% weight loss per month. Sounds easy? Unfortunately it isn’t but there is help out there. They are a number of prescription weight loss diets that can help if you have to cut the feeding amounts back, especially if your dog is a big eater. Cheerios and vegetables, like green beans, make wonderful treats. You also need to commit to regular monthly weigh-ins and make sure your pet is on the right track. Since our blogs are often about senior pet problems we understand that not every dog can exercise easily. If you have the ability, you should look for low-impact exercises like swimming or underwater treadmills. But much like in people, weight loss is really all in the diet. We know it is tough...for you and your dog but it is truly the best thing that you can do for them to give them not only a better quality of life, but a longer one as well. There are a number of causes for dry skin in dogs, such as bacterial, parasitic, or yeast infections, metabolic or hormone imbalances, allergies, poor grooming, under bathing or overbathing, and environmental conditions– dry winter, or hot summer with low humidity. One thing is for sure: dry skin in dogs is common, just like it is for humans. A dog with dry skin can often be observed obsessively scratching, licking, or chewing their skin. Our solution to dry human skin is to simply slap some moisturizer on our dry hairless skin. But for most dogs, that’s not a practical solution because of their fur. So when your dog’s skin is dry and needs extra help beyond your dog’s efforts in grooming, what do you do? We have some solutions for keeping your dog’s skin conditioned. The first thing you should do once you’ve noticed your dog needs some assistance with their dry skin is to determine the cause of the dry skin. Because while treating the dry skin will help your dog stay healthy and comfortable, there may be a deeper cause to the dry skin that should also be addressed. Additionally, not everything that’s safe to use on our human skin is also safe for your dog. Whether it’s a shampoo, conditioner, lotion, or essential oil, always check before putting a new product on your pet to ensure it’s non-toxic to dogs. If you’re not sure whether it’s safe, test moisturizing products on your dog’s skin before applying it all over their body to prevent bad reactions. Your dog has natural oils in their fur that helps moisturize their skin. Regularly brushing your dog’s hair helps remove debris and keep the fur from tangling or matting. Just like in human bodies, massaging dogs can help with skin health. Massage increases blood flow to the skin, which brings nutrients to skin tissues. Not bathing your dog enough leads to the buildup of dirt and oils leading to dry skin, but over bathing also leads to dry skin through the stripping of your dog’s natural body oils. Bathe your dog no less than once a month and no more than twice a week. Use moisturizing shampoos and conditioners that are safe for your dog. Do not use human bath products. Adding dog-safe essential oils is also a good option, and applying natural moisturizers like coconut oil or olive oil to your dog’s skin– including nose and paws –is great for moisturization. Pat your dog’s fur dry with a towel, then allow it to air dry in a warm location or using fans. Using a blow dryer will only make dry skin drier. Don’t forget that your dog has skin too and that just because it’s covered in fur doesn’t mean it’s not susceptible to dryness. Dogs in colder climates are especially susceptible to dry skin like we are, and it’s important to regularly groom your dog to make sure their skin is moisturized. Many natural products are available to moisturize your dog and keep everything from their nose to their paw pads healthily conditioned. For more information about keeping your dog’s skin healthy, look at the pet safe products by PawFriction. Many of us keep common cleaning and disinfectant products in our homes that are not safe for our pets– and really not all that safe for us either. We at PawFriction care about keeping pets safe and improving their quality of life, so we want to empower pet owners with the knowledge that can save their pet’s life. The following are some dangerous household items to avoid using in your home to keep your dogs. Ammonia is often used in de-greasers for kitchen appliances such as ovens, stoves, glass, and stainless steel. The vapors from ammonia burn mucous membranes and can agitate asthma symptoms. When ammonia is mixed with bleach, it creates a poisonous gas which is particularly deadly to small pets. The first thing that comes to mind in relation to formaldehyde is a funeral home and perhaps the familiar pungent stench from dissection in 9th-grade science class. But it’s also used in certain soaps and event some pet shampoos. This makes these products carcinogenic and can contribute to asthma. Chlorine is in many household disinfectants such as toilet bowl cleaners and dish detergents. It’s even used to bleach coffee filters. But perhaps the most likely encounter your dog would have with chlorine is in swimming pools–– so be careful about letting your pet swim in the pool. Chlorine can cause dizziness, vomiting, and laryngeal edema. Many glass cleaners (like Windex), carpet cleaners, and spot removers contain glycol ethes–– which is toxic to pets. Glycol ethers has been linked to lung issues, kidney issues, and anemia in both pets and people. Try to especially avoid using carpet cleaners and spot cleaners that have glycol ethers or to at least take measures to protect your pet from walking on spots containing the cleaner. Floor cleaners like Pine-Sol and Mr. Clean can leave toxic residue and also have strong dangerous vapors that linger. We recommend non-toxic pet-safe cleaners, such as Eco-Me Natural Multi-Surface Floor Cleaner. Certain bathroom cleaners are toxic–– like Clorox Bathroom Cleaner and Scrubbing Bubbles. This can be dangerous for dogs who like to drink out of the toilet. Use an alternative product like Ecover Bathroom Cleaner. We all love all-purpose cleaners, but some of the common ones are pretty toxic–– like Formula 409 and Mr. Clean Multi-Purpose Spray. The sprays have fumes and residues that can linger. We recommend alternatives such as Mrs. Meyer’s Clean Day Multi-Surface Everyday Cleaner. Just because this product is poured down the drain doesn’t mean it can’t be harmful to you or your pet. Those toxic drain openers can give off dangerous vapors that linger in your drain long after you’ve used them. We recommend a non-toxic option like Earth Friendly Enzymes Drain Opener. The truth is that a lot of what we commonly use to clean and disinfect at home can be dangerous to our pets. Be sure to do your research if you have any doubts about the safety of the products you use. Have questions or need solutions to keeping your dog’s paws safe, reach out to PawFriction. How Can I Get My Older Dog Up the Stairs Safely? Aging dogs are like aging humans– they begin to have mobility problems. The movement that was once effortless for an old dog can be challenging and much more labor intensive. These issues with older dogs often manifest as stumbles, unsteadiness, and hesitance. One of the most common issues in senior dogs, however, is moving upstairs. Though it may be distressing to witness your dog seeming too stiff or too weak to climb stairs, there are solutions to this mobility issue that improve your aging dog’s quality of life. As you can imagine, dogs rely a great deal on their back legs to be able to navigate stairs. Weakness in the hindquarters of your pet makes it much more difficult for them to get adequate power to propel them upwards. If your dog feels they don’t have enough strength in their back end, they may balk or refuse the stairs entirely. Additionally, movement down steps can also be challenging for older dogs. Dogs that struggle with balance issues can be especially nervous about heading downstairs because they know they can take a tumble head first if they lose their balance and fall. The best way to combat weakness in your dog’s hindquarters is by taking active steps to strengthen their back end. Taking the right steps to help your dog regain strength in their back end is largely dependent on the cause of the weakness. A dog whose hindquarters are affected by medication might need something different than a dog whose hindquarters have simply been weakened with age. If medication is the cause of weakness, talk to your vet about whether it’s possible to try an alternate drug or at least decrease the dosage. Otherwise, your dog’s condition is worth considering some canine physiotherapy. A pet physiotherapist may have your dog do strengthening exercises in-office or show you some exercises that can be done at home. With aging, it’s important to note that weakness in the hindquarters may not completely go away despite efforts to strengthen them. That’s why you as a senior dog owner should consider making supplemental adjustments around the home to improve your dog’s mobility and quality of life. At some point, you may have to accept that your dog is no longer able to manage stairs. You could opt to carry your dog up and down stairs, or even lift them into and out of your car, but these solutions are cumbersome– for the both of you. ● Put food and water bowls, beds, toys, etc. all on the same level of your home to keep stair usage to a minimum. ● Cover stairs in carpeting. Sometimes simply covering the surfaces in your house with more traction can greatly help your dog’s mobility. Minimize slipping by covering not just your steps but all slippery surfaces in your home that your dog walks on. ● Get a ramp or ramps to assist with movement to elevated levels. A gentle incline is easier for elderly dogs to move on than a staircase. Ramps can be handy for getting in and out of a vehicle, moving up steps, or even getting onto a bed or couch. Anti-slip ramps are ideal. ● Consider a mobility harness to help steady your larger dog when they need it. This tool allows you to lend strength to your dog’s hindquarters when they lose balance and need help, especially when climbing stairs or ramps. ● Get PawFriction to prevent your dog from sliding. Designed by a veterinarian, PawFriction enhances your dog’s downward leg force by preventing lateral slipping and splay-legging increasing mobility and confidence. By applying the safe glue and rubber granules, your pet can immediately experience improved mobility– particularly senior dogs and dogs with special needs. Don’t let your dog’s compromised mobility threaten their quality of life. Take action to both strengthen your dog’s hindquarters and make adjustments around the home to improve their ease of movement. For more questions about getting your dog up the stairs or navigating your home safely, contact PawFriction. My Dog’s Paw May Be Infected, How Can I Tell? Your dog’s paws aren’t typically on your mind until they start limping or favoring some legs over others. If your dog shows signs of a paw injury, this doesn’t necessarily mean they have an infection but it’s important to know how to recognize an infection. Paw infections can be especially challenging to treat because it’s hard to keep your dog from using their paws, and this can prevent infections from healing. In this article, we’ll review the causes, symptoms, and tips for treating an infected dog paw. Like any other kind of infection, paw infections are preceded by the entrance of bacteria’s, viruses, fungi, or other foreign bodies into the tissue of the paw through an injury. Whether the paw injury is a tiny puncture from a thorn or a sore from walking on a hot surface, there’s always an opportunity for an infection to take hold no matter the size of the injury. It’s important to note that infections can also be caused by less obvious things– like allergies. If your dog’s allergies cause them to constantly lick their paws, they can wear down the tissue and cause sore spots that are vulnerable to infection. The same can happen from complications due to flea infestations. Breeds of dogs with less padding on their paws or slimmer limbs– such as the Greyhounds –are more likely to develop paw problems than others. And dogs with compromised immune systems or other health conditions and medications affecting immune systems are also more susceptible. ● An obvious injury– puncture, graze, cut, gash, etc. If you notice the above symptoms in your dog, you should allow your vet to give them a physical examination. They will be able to identify whether your dog’s paw is affected by an infection versus other possible problems. This is typically determined by taking a skin scraping of the infected tissue for analyzation. Your vet may also want to run blood tests and/or x-rays depending on the suspected severity. Different culprits of infection– bacteria, virus, fungus –require different treatments, and the severity and duration of the infection will also determine the treatment plan. Bacterial infections are typically treated with antibiotics, pain killers, and sometimes anti-inflammatory medications. These infections also require the paw to be thoroughly cleaned and bandaged, which you may have to repeat daily until the infection has had time to heal. The better wrapped an infected paw is, the better– because you’re also trying to prevent your pet from licking, biting, or walking on the wound. Your dog may also need to wear a cone collar to prevent them from disturbing the bandage. With the proper treatment and care, paw infections can generally be healed without a problem. But don’t write them off as something that doesn’t require your attention to be resolved because they can cause your dog a lot of pain and also lead to more severe problems. How Can I Keep My Dog’s Paws Healthy? Dogs use their paws like humans use their feet. Because of this, it’s important that your dog’s paws are taken care of especially as they age. The pads of the paw are soft and cushion-like. This is to help protect your dog’s bones and joints from shock, and also to protect during extreme conditions and rough terrain. But like the bottoms of human feet, paw pads are not built to withstand everything they come into contact with and deteriorate with age. So that your dog can maintain optimum mobility and confidence regardless of age or any special needs they may have, it’s imperative to care for your dog’s paw pads. Trimmed nails on your dog’s paws help them stay clean and walk comfortably. If you can hear the nails clicking on hard surfaces when your dog walks, it’s time for a trim. Many dog owners find the task of trimming their dog’s nails difficult or overwhelming, and in this case, it’s best to take your dog to a vet or a groomer. Grooming the hair on your dog’s paws prevents matting. It’s especially important to trim the hair between the paw pads so your dog doesn’t slip on its own fur. Ideally, the hair should be cut even with the paw pads. Just like human hands and feet, paw pads can get dry and cracked– especially in the winter. But it’s not a good idea to use human lotions on dogs, so we advise you to speak to your vet about the best paw moisturizer. Even our pets get tension! A good way to care for your dog’s paws is to give them a little rub. The sweet massage spots on dog paws are between the toes and right on the paw pads. A quick paw massage every once and a while will get the blood flowing in your dog’s paws. It’s easy for small objects to get lodged in your pet’s paw pads. Be aware when your dog is trying to stay off a certain paw or when they appear distressed that there could likely be something stuck in their paw. Splinters, broken glass, pebbles, or other small objects are common culprits. Whether from a foreign object, a misstep, or something else, sometimes dogs end up with cuts or scrapes on their paws. If the cut that is smaller than a half inch, you can take care of it at home with antibiotic wash and a loose bandage. Consult your vet if the cut is larger than a half inch. Walking on hot pavement or sand in the summertime can cause the paw pads to burn. Try to avoid these surfaces, but if your pet does burn its paw, you can treat it the same way as a cut. While cold weather can dry out and crack your dog’s paws, a more serious risk is the chemicals we use to melt ice. These chemicals can be toxic if your pet ends up with some on its paws then licks the paws. Avoid this situation by washing your dog’s paws with warm water after coming in from outside when salt or chemicals have been used recently. Or you can coat the paw pads in Vaseline prior to going outside. For senior pets and dogs with special needs, PawFriction is a great option for helping them regain necessary paw pad traction. The application is simple, safe, and helps your dog stay healthy and confident! Shop PawFriction now to learn more about getting your dog back to the paw traction he or she needs. When most people think of dog boots, they think of a pampered pooch who is doted with a luxurious life by its owner. While much of the footwear for dogs out there is created simply for the delight of the owner and not any real purpose for the pet, there are dog boots out there that have a real practical purpose for the dog. Many of these dog boot companies will try to sell you on the idea that dog boots aren’t a luxury but an actual necessity for your dog. But that’s simply not true. Not all dogs have a need for footwear. After all, many dogs already have plenty of paw padding and strength in their legs to live comfortably on their own four feet. Therefore, we at PawFriction say that not all dogs need boots– and you shouldn’t believe a dog boot company that tries to tell you any different. However, that begs the question: what are the practical reasons to consider boots for your dog? As a pet owner, one of your highest priorities is your pet’s quality of life. Both your environment and aging of your pet can affect what’s happening on the bottom of your pooch’s paws. ● You live where there are snowy or icy winters and salt or other chemicals are used on walkways, so your dog’s foot pads can get irritated, dried, cracked, and even bleed. Dogs’ feet are tough, but extreme temperatures, rough surfaces, and toxic substances can cause them harm. Injury from these conditions can cause sensitivity on the pads of your dog’s paws, and gently pressing on the pads can reveal if your dog may be suffering. When your dog is experiencing any of the above conditions, it’s worth considering a set of dog boots to keep them comfortable while they recover. However, there are more serious conditions that aren’t as easy to observe in your dog, and these are the more serious reasons to consider getting something to aid with the friction between your dog's paws and the surfaces they walk on. It’s true of any mammal: without use, muscles lose their tone and flexibility– which leads to atrophy over time. When dogs experience orthopedic, neurological, or degenerative diseases, the strength of their muscles are compromised and this can seriously impact your dog’s ability to move. Without the strength of their muscles, a dog cannot get friction with their paws on any surface. When there’s no friction, there’s no mobility. PawFriction enhances dogs’ downward leg force by preventing lateral slipping and splay-legging, increasing mobility and confidence in dogs. These paw pads have conclusively proven to add traction to the canine foot and not the nails. There’s no better way to restore the mobility than to use the mechanism already in place. That’s why PawFriction uses rubber to restore mobility and effectively increase the friction that the paw pads have lost. It’s specifically aimed to counteract the splay-legged sliding of the back legs. Dog boots are not a necessity, however, paw pads can sincerely improve the mobility and confidence of a dog whose muscles are compromised by the aforementioned conditions. PawFriction is a paw pad made in mind for dogs that need support while dealing with weakened muscles. Check out PawFriction to change your dog’s life. Why Does My Dog Not Want To Walk On Smooth Surfaces? Some dogs just don’t like to walk on smooth surfaces - this could be the result of their temperament, depression, anxiety or a host of other reasons. If you see that your dog suddenly becomes afraid of walking on slippery surfaces then we suggest that you first make a trip to your vet so that they can help determine the root cause. 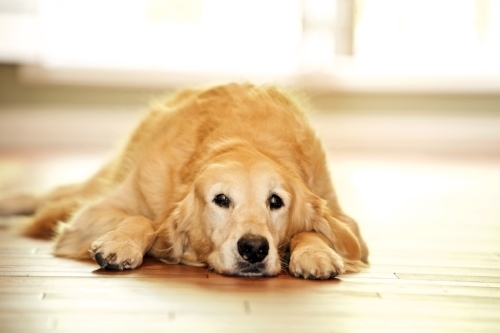 Your dog’s behavior may well be the result of an undiagnosed orthopedic issue. Age may also be a large contributor to the fear of walking on hardwood floors, laminate or any other type of slick surface. As dogs age they lose their mobility, which ultimately can cause them to hesitate from walking on smooth surfaces as compared to when they were young and more confident. PawFriction is a great tool to help senior dogs, dogs with mobility issues (post-surgery) and those with anxiety and fear. PawFriction is very easy to apply and has proven time and time again that it can help your dog get back on their paws! Paw Pad Sweating in Dogs: Why Does it Happen? One of the most common product questions we receive at PawFriction is “Dogs sweat through their paw pads to stay cool, doesn’t PawFriction stop their ability to sweat?” We are happy to answer that question because it clears up a massive misconception in the canine world, why dogs sweat through their paw pads. As a vet, when we started developing the product I believed the same thing about paw pads, that the sweating was for cooling purposes. Actually, in veterinary school, we were taught to place alcohol on the paw pads of overheated dogs to cool them down. Well, we know so much more now than we used to and much of the above has changed. From the boring side of things, let’s discuss the paw pad sweat physiology. Dogs absolutely sweat through their paw pads but they have a unique type of sweat gland called an eccrine sweat gland. Through a myriad of scientific testing, researchers have shown that these paw pad glands respond to fight of flight situations. This is why a dog’s paw pads sweat when they go into the veterinary clinic. But, why do they sweat then? Sweating of the paw pads causes them to soften which prepares the paw pad for running…it actually increases the friction of the paw pad, it has nothing to do with cooling the dog at all…crazy right? In our research, we have actually learned that critical care veterinarians no longer even recommend placing alcohol on the paw pads to cool off an overheated dog. The next logical question to answer is: If sweating increases traction then why would we place something over the paw pad? The other thing that we have discovered is that the sweating of the paw pad actually disappears as a dog ages, it is one of the reasons we see such issues with older dogs sliding. Also, PawFriction doesn’t block the paw pad from being able to sweat; there is a large amount of space on the outside of the paw pads for sweating to still occur if used on a younger dog. It's Summer, Keep Your Dog Protected! Did you know that PawFriction has thermal dampening properties which can reduce risk of injury while dogs are walking? This is a great benefit of using PawFriction during the hot summer months! Does your dog like to cool off at the pool or in the lake? PawFriction will generally not be affected by water if you allow for a full 12 hours between the application and exposure to water or a water treadmill. In the hot summer months we encourage you to help your dog stay cool and active as long as they have ample supervision when swimming. Remember, dogs are ACTIVE and we need to help them burn off their energy which can be channeled into activities that keep them energetic and healthy. Exercise such as swimming also helps keep our furry best friends from being destructive out of boredom! Swimming is a great cardio workout for dogs. We can’t stress the importance of supervising your dog while swimming (or even taking a “swim” in the bathtub). "Why is PawFriction so expensive?" At a recent industry event, we were asked, “Why is PawFriction so expensive?” We can certainly understand this concern, but the answer is summarized here. Keep in mind that PawFriction is sourced and manufactured in the United States. Rather than saving money on using labor services sourced overseas, we employ a sheltered adult workshop to assemble the PawFriction kit and all components within the kit. In addition, our adhesive is a specific Medical Grade cyanoacrylate and the rubber granules are certified virgin rubber (which means that it never consists of heavy metal laden found in reclaimed tires). Please keep in mind that we simply don’t cut corners - your pet’s health and safety is our number one priority! Each kit is designed to last anywhere from 6 to 16 weeks, depending on the size of the dogs paw pads and other factors that may cause it to wear off. We anticipate that the adhesive and granules will need to be reapplied weekly. Do you have a story to share? If so, please email it to us at info@pawtology.com. Does PawFriction harm floors or stain carpets? We are often asked if PawFriction will harm floors or stain carpets. One of the many wonderful things about PawFriction is that it is not only pet and human friendly, but it is also a household friendly product. The granules are made from pure rubber, this is not the type of rubber you find in automobile wheels, rather a virgin rubber that is 100% safe for floors. Although, PawFriction has color it will not stain or damage carpeted floors. We have heard many stories about how pet parents use throw rugs and runners throughout their house to help with their dog’s traction. With PawFriction you can live in a home free of multiple carpet remnants and other floor coverings. Do you have a story to share? If so, please email it to us at info@pawtology.com. My dog is a foot licker, will they try and get this off? Most dogs simply do not realize that PawFriction is on their feet but, rest assured if they do lick their feet this may give them a whole new thing to do in life. We have researched and tested each component of PawFriction and it will not harm them. PawFriction is 100% safe if ingested, the granules are made from pure virgin rubber which means that it is not generated from churned up car tires or anything else that could be harmful to our best friends. If you have a foot licker and have questions, please let us know! We have received a tremendous amount of positive stories from our pet parents over the last few months and we are so pleased to hear about how successful PawFriction has worked for them. If you have a story or video to share please email it to us at info@pawtology.com. Disc disease, IVDD, back injury, slipped disc, etc. It has many names and is one of the more common reasons that a dog will be brought to a veterinarian for evaluation and is a result of pain and discomfort. In order to understand how to manage the disease and what it is, we have to do a quick review of the anatomy so hold on for the boring stuff! The spinal column is made up of multiple vertebrae with a cartilage disc in between each one. The disc’s purpose is to separate the vertebrae and provide cushion during movement. The disc itself is formed similar to a piece of Rolo candy with a thicker outer shell and a softer, more gelatinous center. A disc injury, whether it is located in the neck or back, is an expulsion of the center of the disc which puts pressure on the spinal cord and creates a lot of inflammation and ultimately pain. The symptoms of a disc injury include pain, hunching up of the back, pain when being picked up, reluctance to go up the stairs or jump, wobbly or dragging back legs, or even the inability to use their legs. Any of the above symptoms require a veterinary visit as soon as possible but any inability to use their legs or walk requires an emergency visit immediately! Diagnosis of IVDD (intervertebral disc disease) is often done on examination through various exam findings which may include palpation of the spinal column, neurologic examinations and history of your pet. Radiographs can be helpful but will often miss the obvious diagnosis of the problem, you really need advanced imaging of the spinal cord either by MRI or CT scan. Treating IVDD is aimed at both the acute injury and chronic management of the disease. 1. Acute Injury: Therapy is often guided by the severity of the injury. If the neurologic deficits or compression of the spinal cord is significant, surgical repair is often recommended. If your dog is still moving normally but just painful then pain medications and strict exercise restriction is recommended. Keeping your dog from sliding or falling is very important. We recommend PawFriction to aid in recovery from a back injury and in the post-operative setting if your dog has back surgery. 2. Prevention/Chronic Injury: Chronic pain medicine may be necessary if you dog remains in pain after their injury. Weight management is extremely important for all dogs prone to spinal injuries. Rehabilitation, acupuncture, etc. can all improve your dog’s long-term mobility and decrease risk of re-injury. Traction aids like PawFriction can be paramount in preventing your dog from re-injuring themselves. Thankfully, most dogs we see with spinal injuries often respond to conservative treatment but remember, the success of IVDD surgery in dogs is very good when early intervention is performed. Don’t be afraid to discuss with your vet about whether a referral to a neurologist is necessary. Also, don’t forget the importance in restricted jumping, sliding/slipping, and decreased activity level, which will keep your dog’s back stronger and healthier in the long run.